The Ocean County draft Hazard Mitigation Plan should be a huge wake-up call to the people of Ocean County (you can view and download the plan here). The Plan is just more evidence that shows how extremely reckless and irresponsible Gov. Christie’s push to rebuild the shore is, without considering future risks due to climate change and sea level rise. The State is spending billions of taxpayer dollars on infrastructure and allowing people to rebuild in areas that will be under water permanently, even without a storm. The Plan is the first County plan I am aware of that considers the vulnerability, risks, and impacts of climate change, sea level rise, and extreme weather and coastal storm surge. It is not clear what other coastal county Hazard Mitigation Plans also consider climate change impacts – we hope to report on that soon. 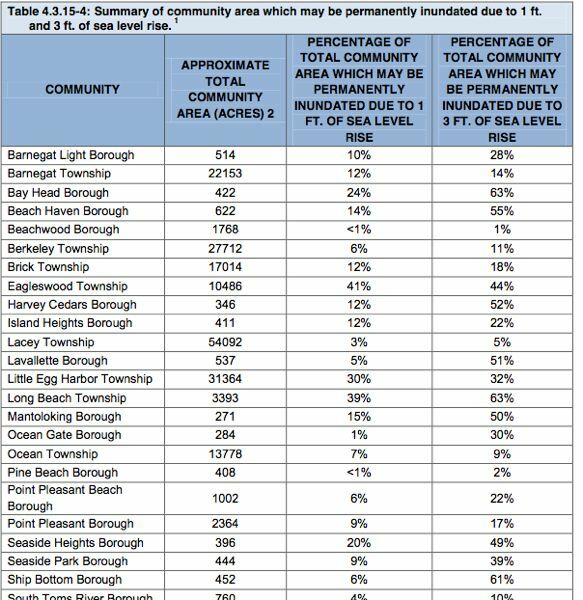 The Ocean County Plan shows the major portions of the county will be permanently inundated – underwater – due to projected sea level rise. Sea level rise make storm surge far worse. I testified during last week’s Legislative hearing in Tom’s River about that plan and urged legislators and the public to review it carefully. Prior to that hearing, I visited the Ocean County Planning Department to ask to borrow maps from the Plan to use at the Legislative hearing. County planners were unaware of the Hazard Mitigation Plan, which was prepared by private consultants working for the Ocean County Sheriff’s Office. A I’ve written numerous times, the Christie Administration has refused to consider these climate change issues in Sandy preparation or Sandy recovery. And FEMA flood elevation maps and the National Flood Insurance Program also do not consider these projected conditions and risks. Back bays are particularly at risk – underwater – permanently inundated, with just 1 foot sea level rise. The range of sea level rise values is from 6 inches to over 6 feet. 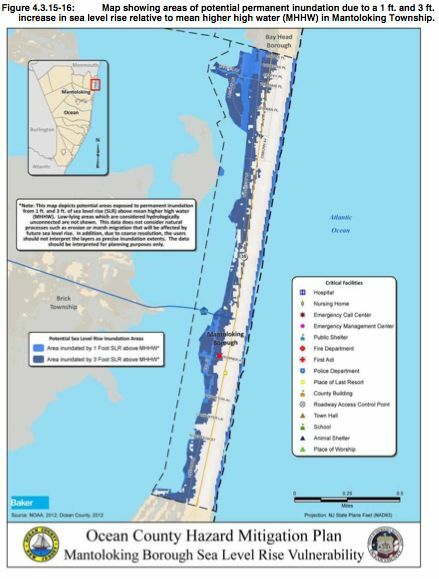 While New Jersey and other states have put a major focus on building extensive dune systems following Sandy, those dunes will only protect the immediate oceanfront area, Psuty said. Communities on the bay side of barrier islands will see no protection from the dunes, he said. The draft plan is now out for public comment, so now is the time to consider how sea level rise will impact the shore and plan accordingly. I would add that this is not exclusively a County issue – the State has lead role in Hazard Mitigation Planning, so much more accountability needs to be done on Christie Administration’s failures. NJ Transit is just the tip of a large iceberg. More to follow as this develops. die Baukredit – Was ist das Faszinierende an der Baukredit?